Were any changes made to the composition of the Shuttle's thermal protection tiles over the lifetime of the program? One of the main components of the Space Shuttle's thermal protection system for reentry was the layer of tiles on the outside of the orbiter. What, if any, changes were made to the composition of these tiles between the first and last flights of the Shuttle program? In 1981, each shuttle had more than 24,000 tiles of six by six inch blocks made of silica (high grade sand) and fibres. These are made of silica fibres and chemicals mixed, molded and heated at microwave oven at 2350 degrees, at which temperature the silica fuses to form a high temperature insulator. Would the Space Shuttle have met the current NASA manned flight standards? Was Shuttle tile loss an accident waiting to happen? Shear forces between Shuttle, tank, and boosters - what pushes what? Were ejection seats on the Space Shuttle a practical safety system? What was the first time a “re-used booster” was used to put a payload into orbit? Why will SLS Block I bring less mass to LEO than the STS shuttle system did? 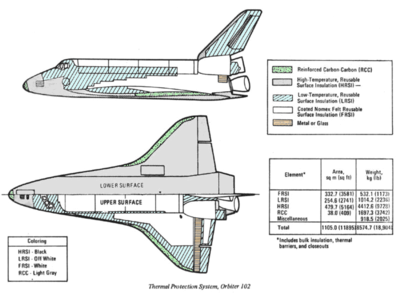 Why didn't the space shuttle use non-foam-shedding external tanks?